Kourosh Zolani was born in a small village in Iran. He does not come from a background that encouraged him to become a musician; indeed, he comes from a small town where music is not a part of everyday life and is, in general, considered taboo. His life story is featured in a music video on YouTube: http://www.youtube.com/watch?v=jeG8J9cGdiU Kourosh has received numerous awards for his performances and compositions. Kourosh has received numerous awards for his performances and compositions. He is the first musician to perform on the Chromatic Santour with a symphony orchestra, performing his original scores at venues such as the Kennedy Center in Washington DC and in the Roman city of Jerash in Jordan. 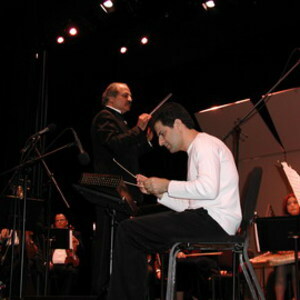 Kourosh has pioneered a method of tuning the Santour in a chromatic manner, which allows western-style scales and music-styles to be performed on the instrument, thus widening the instrument's musical reach.